Spending a few days in a caravan offers a surprising insight into just how much water we humans get through in a typical day – a minimum of 23 litres. And unless you are lucky enough to have a fresh water supply direct to your pitch, that means carrying at least 23kg from tap to caravan per person per day. The easiest way of carrying water, is in a rolling barrel water carrier such as an Aquaroll or Water Porter. A short length of food-grade filler hose with rubber nozzles that fit over the tap is handy for directing the water cleanly from the tap into the water carrier. 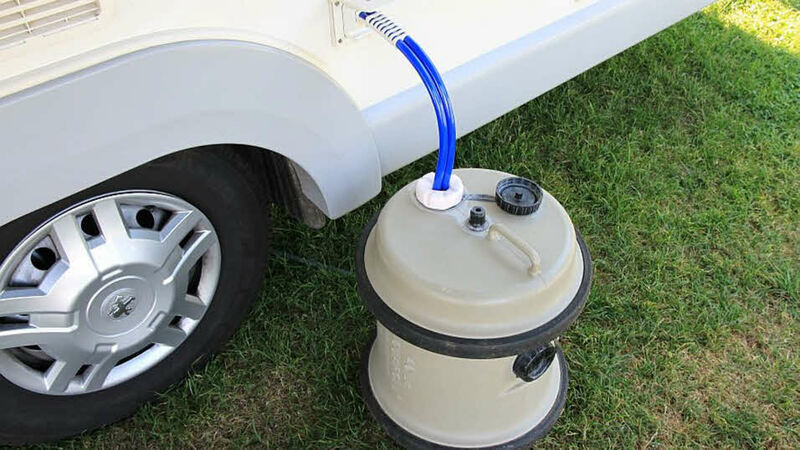 Virtually all new caravans use 12-volt water pumps and whichever unit is used, it’s important to dunk the pump in the water supply and shake it about under water before plugging the inlet in, to eliminate air locks. When the caravan has been left standing for several weeks, before bringing the water system back into use, flush the entire system out with steriliser such as Milton. Follow the instructions carefully and do not use domestic bleach. Clean out any connecting hoses and fresh water containers at the same time. Drain down the system (open all taps to allow air in, enabling the system to drain quickly). Remove any water filters fitted, and replace with a short length of hose or empty filter cartridge (this will ensure the filter is not affected by the disinfectant/sterilising solution). Fill the system by using the pump with a disinfectant/sterilising solution (check that the solution at full strength appears at all taps/showers). Allow to stand for the recommended period of time. Drain the system down completely. Thoroughly clean the outside of all taps/connectors with a cloth soaked in the disinfectant/sterilizing solution. Flush the system through with clean drinking water until no traces of disinfectant/sterilising solution can be detected at any tap. Filters should be replaced at the recommended intervals, irrespective of how often they have been used. Most caravans are equipped with submersible pumps, whereas motorhomes are usually fitted with diaphragm pumps. A good quality submersible pump should give unfailing service for 10 years or more, but many develop faults more frequently – so always carry a spare, especially if travelling abroad. Is the battery discharged? Try the lights to see if they work. Is the pump switched on at the distribution unit? Many caravans have a control switch. Has a fuse failed? Fuses are usually fitted at the distribution unit in the wardrobe or under the front seats. With a submersible pump, air sometimes gets trapped in the casing. Disconnect the hose from the input coupling and swing the pipe so the pump gently strikes the side of the water container, under the surface. This usually dislodges air bubbles. With a diaphragm pump, if grit gets into the pump, its mechanism is soon damaged. Check the filter regularly and clean if necessary. If there is internal damage, the pump can be serviced or repaired by the supplier. One of the seals or O-rings inside the assembly sometimes fails and pump chambers cease to be airtight. Spares kits are available but repairs would normally be referred to a specialist. In general, one of two systems is used: either a tiny switch is fitted in the tap itself – called a microswitch – or a switch activates the pump when it senses a drop of pressure in the supply system – for instance, when a tap is turned on. This is called a pressure-sensitive switch. Damp can cause the downfall of a microswitch and in some instances the whole tap has to be replaced. In most cases, however, the switch can be easily changed by a qualified electrician. The Club does not endorse the listed products and you should satisfy yourself as to their suitability. Always, check that the installation of an after-market accessory does not invalidate your warranty. With thanks to John Wickersham. John’s books, The Caravan Handbook, The Caravan Manual and The Motorcaravan Manual (Haynes Publishing) are available from bookshops.